In the wake of the Charleston shooting, and subsequent pictures of the shooter posing with a Confederate flag, Barack Obama this week said that the flag belongs in a museum. It seems he has changed his tune in the last three years somewhere, however, given that he was using the symbol during his 2012 re-election campaign. The quote was taken from Obama’s racially heated speech in 2008, during which he also praised his mentor former pastor the controversial Reverend Wright. Obama was not alone in using the symbol of the Confederate flag, synonymous with the South, to solicit political support. 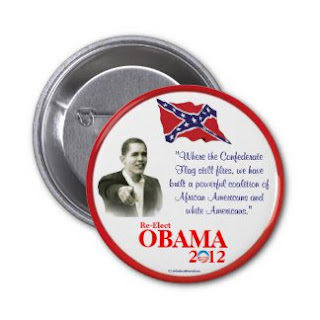 Hillary clinton had her own brand of Confederate merchandise in 2008. She’s also staying quiet about her husband’s previous use of the ‘racist’ symbol. Strange given that she has also stated that the flag has no place in the US today. While online auction site eBay declared it would prohibit Confederate flag merchandise, these items still remain available. Walmart and other retailers have jumped on the bandwagon to ban a flag, as if this will make any difference to racial tensions currently playing out across the nation. “It’s undeniable that the history and the heritage of South Carolina, rebel U.S. state of the first order, are intertwined. Period.” Simmons added, urging that the flag represents heritage. “You cannot give true due to South Carolina and its history and heritage without marking the roles that blacks have played, as well as their history and heritage.” Simmons added.